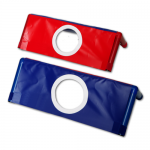 A Focus Target Barrier for use in fielding or batting activities. View the videos below to see it in use. Movement, pick up and throwing to target activity for two players using two Cricket Factory Target Tunnels. Catch and throw activity for two players using two Target Tunnels. Distance between the two targets can be altered after a successful throw into the target circle.